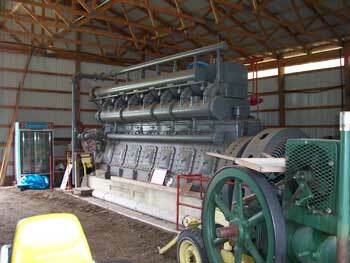 The Western Michigan Old Engine Club was formed on February 10, 1974 in Riverton Township. Located between Scottville and Ludington in West Michigan, 21 people gathered for the first meeting. Members of the club are interested in restoring and running old gas hit and miss engines, steam engines, or other antique equipment. Originally, the collection was exhibited at the Fred Donohue's farm south of Ludington. When the collection became too large for the farm it was moved to Mason County's Historic White Pine Village. The collection soon outgrew this location as well. In 1990, the Western Michigan Engine Club was moved to its permanent location on 22 acres at Riverside Park in Scottville, Michigan. 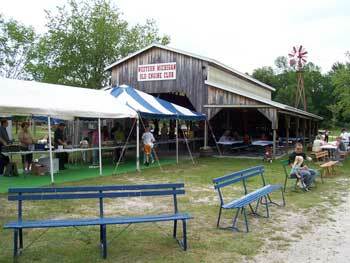 A pavilion was built at this location and the club hosts its annual show on the first Friday, Saturday, and Sunday of August. Since many of the present members of the Old Engine Club are aging, they're looking for younger members to join to keep the club going. You don't have have to own a tractor, engine or machinery...just have an interest in what the club is about. Held the first weekend of August at Scottville's Riverside Park, the Old Engine Club Show has been an annual event for 45 years. It's so popular that many of the participants bring their tractors over on the S.S. Badger carferry to Ludington and caravan the back roads to Scottville. Refreshments and food are available. Admission is Adults $6, Kids 12 & under free. Thursday is Senior Day, 65 & older $5. Gates open Thursday, Friday & Saturday from 9am-6pm, Sunday from 9am-2pm with limited show and displays. There are different events each day during the show including daily tractor pulls featuring antique tractors, garden tractors and doodle bugs. Daily events include tractor parades, large flea market, arts and crafts and swap meet. Saturday is Kids Day from 10am-4pm featuring a Garden Tractor Pull for Kids 8-15, along with a Pedal Tractor Pull, Valve Cover Racers, Scavenger Hunt and Bird House Building. For more information, see www.oldengineclub.org. 27 - Garden Tractor Pulls, 10am & 1pm. 18 - Garden Tractor Pulls, 10am & 1pm. 24&25 - Annual Swap Meet, 9am-5pm. 15 - Antique Tractor Pull, 10am. 29 - Garden Tractor Pulls, 10am & 1pm. 13 - Antique Tractor Pull, 10am. 20 - Garden Tractor Pulls, 10am & 1pm. 1-4 - Annual Old Engine & Tractor Show. 4 - Antique Tractor Pull, 10am. 8 – Garden tractor transfer sled pull at Western Michigan Fair Grounds, 7pm. 24 – Garden tractor transfer sled pull at Oceana County Fair Grounds, 12pm. 7 - Antique Tractor Pull, 10am. 14 - Garden Tractor Pulls, 10am & 1pm. 18 – WMOEC Education Day. 5 - Garden Tractor Pulls, 10am & 1pm. 12 - Antique Tractor Pull, 10am.